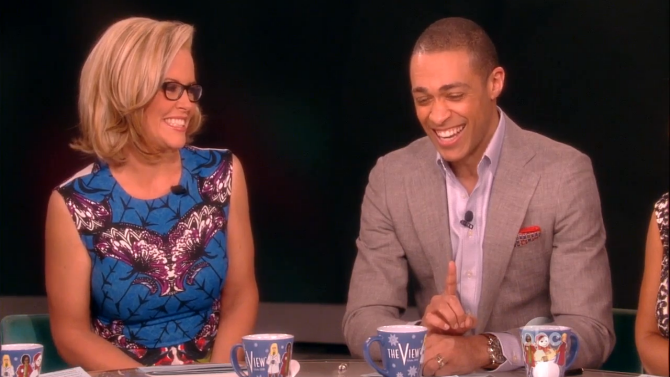 Some of the most fun I’ve ever had in my television career was as a guest host on “The View” in March. You get to sit next to four incredibly accomplished women, but you’re also hosting the show in front of a live studio audience of about 200 screaming women. And, you’re being watched on TV by millions of women. See why this might be fun for me? So, of course, I’m excited to be heading back to guest host the show on Monday. Sitting there as the lone man on the show is one of the coolest but also daunting things about the experience. No matter what, you’re going to stand out just because you’re the only guy, and your perspective is going to stand out as well because it will often differ from that opinions of the women on the show, as well as the women in studio and watching at home. What you say can get you cheered, booed, or banished. But what you say can also be of incredible value to the audience. I’ve discovered on the show what is also true in my personal experience: women want to hear from guys. I literally get calls, text messages, emails, and even tweets from female friends, colleagues, and strangers every week and sometimes everyday wanting a male perspective about something. Often times, it’s a dating/relationship question. Women want a male opinion, and it’s usually better received when it’s coming from a guy who’s not trying to sleep with them. You might think that being brutally honest while surrounded by so many opinionated women would potentially be intimidating. But, the opposite is true on “The View.” Even if the hosts and the audience don’t agree with what I have to say, it’s an environment where I always feel like my opinion is sought after, welcomed, and appreciated. Too bad that’s not the case at my house.